​At 16, Lucero Alvarez Vieyra sat nervously in front of Gerald Jones, a college-prep advisor. The high schooler was ready to tell him she'd no longer be applying to college. Having learned she was pregnant, Alvarez Vieyra couldn't see how she'd be able to juggle motherhood and college; her aspirations of becoming a medical researcher would have to be put on hold. But the advisor presented the teen with a different approach: Change your path, he told her, not your dream. Jones, director of the Upward Bound program at Sonoma State University, then helped outline a way Alvarez Vieyra could manage being a mom while earning a biochemistry degree at Sonoma State. "Mr. Jones reaching out to reassure me that [going to college] was still possible made all the difference in the world. Seeing all the effort that was placed into me encouraged me to keep going," she says. "If we hadn't had that talk, who knows where I would be today." Now in her third year on the campus of 9,500 students, Alvarez Vieyra will soon begin to conduct lab research, participates actively in the Chemistry Club and the Makerspace lab, and has traveled abroad on research trips offered through the Louis Stokes Alliance for Minority Participation program. 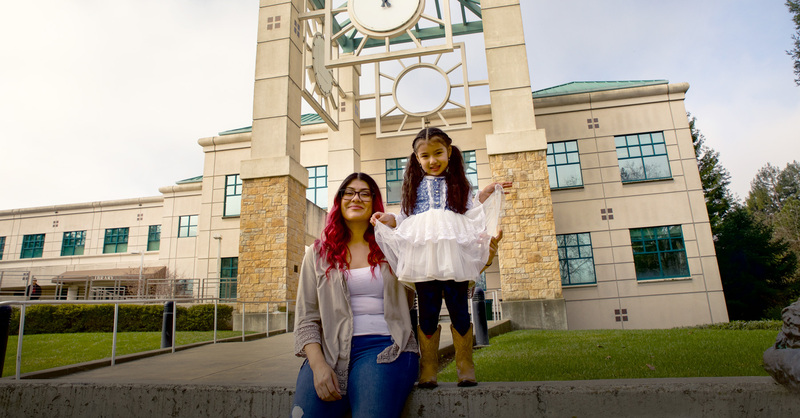 It wasn't until Alvarez Vieyra enrolled in Sonoma State's Upward Bound Sonoma County program as a high school sophomore that she even began to think college might be an option for her. The federal program, which prepares low-income, first-generation college students to enroll in and graduate from a four-year university, introduces high schoolers to college terms and processes. Though Alvarez Vieyra loved Upward Bound, her first year in college wasn't in any way easy. She struggled to balance motherhood, school and work; and she was placed on academic probation. The following year, her family faced homelessness. Not surprisingly, she thought about dropping out. Then her advisors and professors at Sonoma State stepped in, just as her college-prep advisor had done years earlier, presenting her with a direction that would keep her on track to graduate. "Just seeing how many faculty members genuinely care and want to see me succeed makes me want to push on even more," she says. "These are the people who believe in me during the times I don't believe in myself. "The CSU has impacted me in the most positive ways. I have the support I need to overcome the challenges I face." ​"I Now Feel As Though I Belong"
Beyond the weighty responsibilities of a single mother attending college, Alvarez Vieyra remembers not feeling part of the campus when she first arrived. So when faculty encouraged her to join a club or activity at Sonoma State, she didn't really understand why. Still, she followed their advice, becoming a paid peer mentor. Before long, things began to click. "Once I started to be more involved, I felt more welcome and not alone," she says. "I now feel as though I belong — this is what I lacked my freshman year. I can't emphasize how important it is to be involved on campus." Her role as mentor gives her the chance to help and comfort students who feel as at sea as she once did. "I know how it feels to be completely lost in the college world; it's not a good feeling," Alvarez Vieyra adds. "Because I can relate to them and many of the things that they are going through, students believe in me and trust me." When Alvarez Vieyra receives her bachelor's, she'll be the first in her family to have earned a degree, a tremendous accomplishment she plans to follow with a Ph.D.
Just as important is the knowledge that she's paved the way for daughter Mia: "I want her to want to go to college. And for her, it'll be easier than it was for me because she'll have someone in the family who has done it before — me." So when motivation flags at the end of a long week full of studying, working and parenting responsibilities, the 20-year-old mother looks at her lively 4-year-old, who attends Sonoma State's on-campus Children's School while Mom goes to class. "I want to create a better future for Mia. I want to be a role model for her," explains Alvarez Vieyra. "[Earning a degree] means so much more to me now because it means I will be able to secure financial stability for my daughter. "It is important for her to see me graduate and see all of the hard work I have put into earning this degree."